Small Paw Print Take-Out Pails. Shipped preformed - all you do is fill, fold down and lock the top. This pail is smaller at the bottom and larger at the top. Dimensions listed are closed lid dimensions. Chinese Take Out Pails make unique favor boxes for packaged gourmet foods, party favors, pet treats or any festive presentation! These pails are great for basket stuffers, soaps, bath salts or wrapped food. 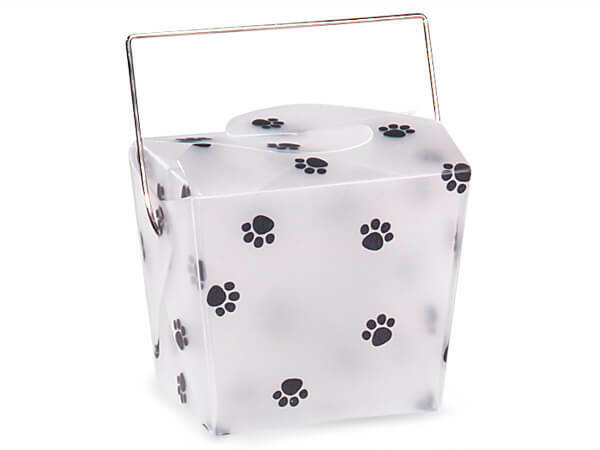 Paw Print and Bone print boxes are great for pet treats. Wire handles are pre-attached for convenience.